Last week was a prodigious one in the kitchen. I became inspired to keep my blogging life alive, and in the process I decided to photograph most of what I cooked, and share it with you. Obviously that doesn’t include toast, though I must say there have been some spectacular toasties…but I digress. I was in ‘pie mode’ last week, and as I made room in my freezer for that gigantic batch of panir cheese I found a ziplock bag of homemade pie pastry from a previous baking expedition. It seemed like just enough for another pie! 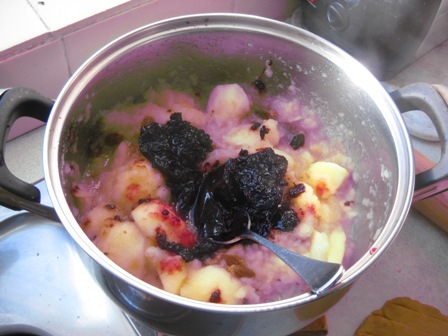 Glancing at my kitchen table I noted the large bowl of cooking apples, and then I suddenly remembered that jar of blueberry jam that I had cooked for a bit too long and which had turned to a very firm jelly. 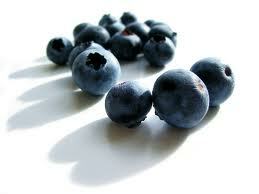 Blueberries seem like they contain a lot of pectin. I had left a batch, made from only 150g fresh blueberries, on the stove too long, and when I let it cool, I noticed it had stiffened. 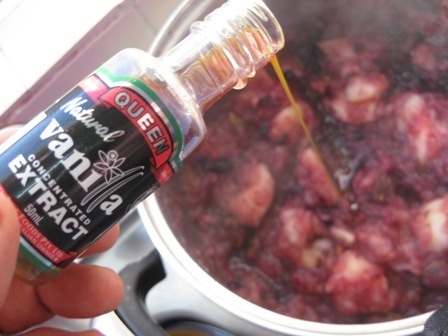 I had only added a small amount of sugar, so it had not caramelised, and the flavour was wonderful. 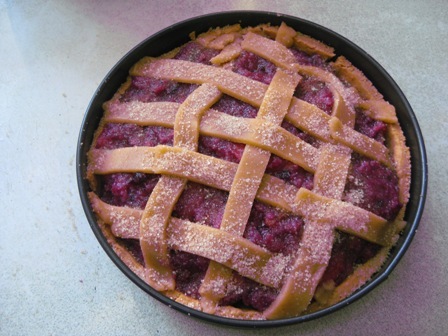 So there was our pie sorted – apple and blueberry. 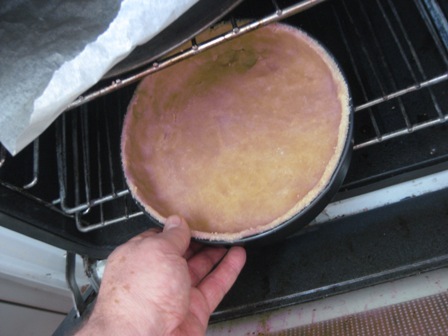 I let the frozen pie pastry thaw out, then I rolled it and filled a pie tin that had a removable base. 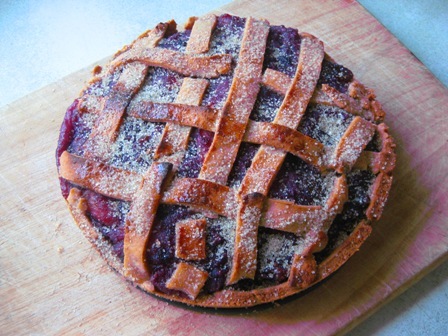 Some leftover pastry was rolled and sliced into strips for a lattice top. I had prewarmed the oven; now for a full pre-baking of the crust. I find that essential for a pie that’s baked properly, top and bottom. No need for baking blind or anything too fancy. I knew the pastry was a fairly rich dense one, and that it wouldn’t rise. 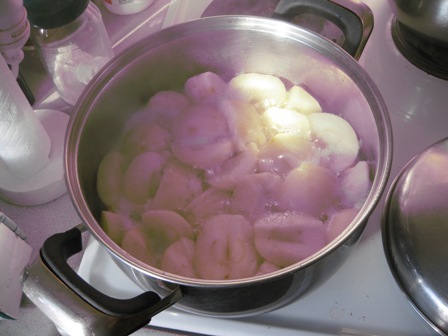 While the pastry was baking I peeled and cut the apples into large pieces, added a little water and stewed them on high heat. I added a handful of giant golden raisins – I tracked down a small package in my pantry. These are the variety from Chile – long, golden, almost see-through, and sweet like confectionery. A fine partner for apples. 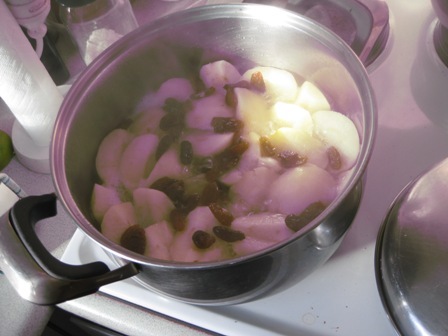 The apples are done – still a few chunky bits, as I wanted. Off the heat. Time to add the blueberry conserve – the whole jar. I’m not adding any other sugar to the pie filling. A flash of inspiration! Some pure vanilla extract. Who can resist? Not me. I had originally thought of adding cinnamon, but vanilla and blueberries are made for each other. The mixture is slightly moist, so I reach for a tiny bag of homemade white breadcrumbs from the freezer. I add those to the mixture, and now the texture is perfect. I have found breadcrumbs to be more unobtrusive as a thickener than, say, cornstarch. 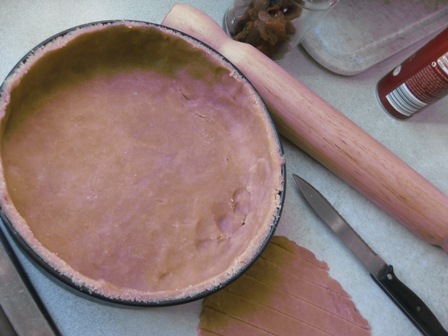 The pie crust is done, so the filling is spooned in, and the latticework – a bit rustic – is added. Ready to bake! The base is fully cooked so all we have to do is make sure the lattice is nicely browned. I add a good sprinkling of raw sugar on top of the pie for some extra caramel sweetness. And there it is. I’d offer you a slice, but alas, it has gone the way of all good pies – to pie heaven.